California’s money bail system is “unsafe and unfair”—that was the finding of a workgroup brought together by Chief Justice Tani G. Cantil-Sakauye to study the issue. The report proposed a new system that calls for a judge’s decision to release or detain a defendant before trial be based on that person’s threat to the public and likelihood of making court appearances—not their ability to pay. Four recommendations from the Commission on the Future of California's Court System moved forward for further study: moving minor traffic infractions out of criminal court; revising civil case tiers to make the justice system more accessible to low- and middle-income court users; creating new self-help programs and resources for those without attorneys; and using technology to increase opportunities for remote court appearances, voice-to-text language interpretation services, and self-help chatbots. 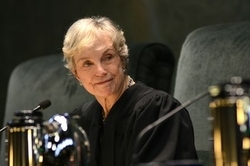 The Judicial Council awarded more than $23 million among 29 California trial courts that are testing new approaches to make court more accessible and setting up new collaborative “problem-solving” courts that promote recovery and cut recidivism. The council greenlighted 53 programs, from one that allows litigants in rural Placer County to access their court remotely via videoconference to a court for veterans that will partner with a VA treatment facility in Contra Costa County to provide critical services. 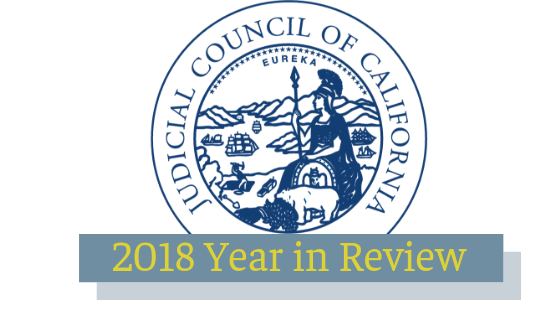 Despite severe funding challenges, the branch opened three new courthouses in 2017—in San Diego, San Joaquin, and Alameda counties. 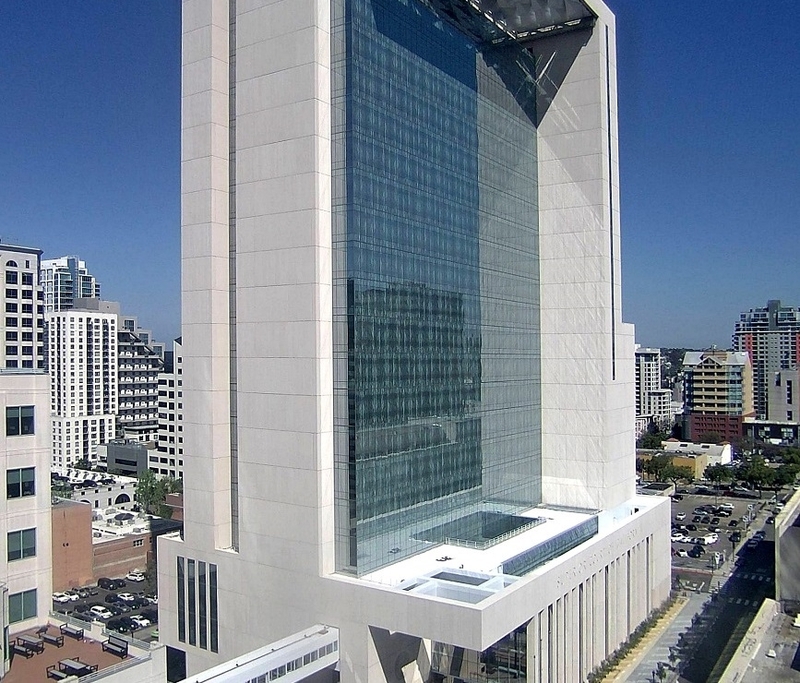 The San Diego courthouse, above, is the state judicial branch's largest court construction project to date, with 71 courtrooms in 25 stories totaling more than 700,000 square feet. Another 17 new courthouse projects are in various stages and 10 more are indefinitely delayed until further funding can be identified. Court participation and support for the Chief Justice’s Power of Democracy civic learning initiative continued to grow, with 13 counties coordinating Civic Learning Partnerships (up from 6 in 2016). These partnerships bring together schools, businesses, and local judges to support civic awareness and engagement. 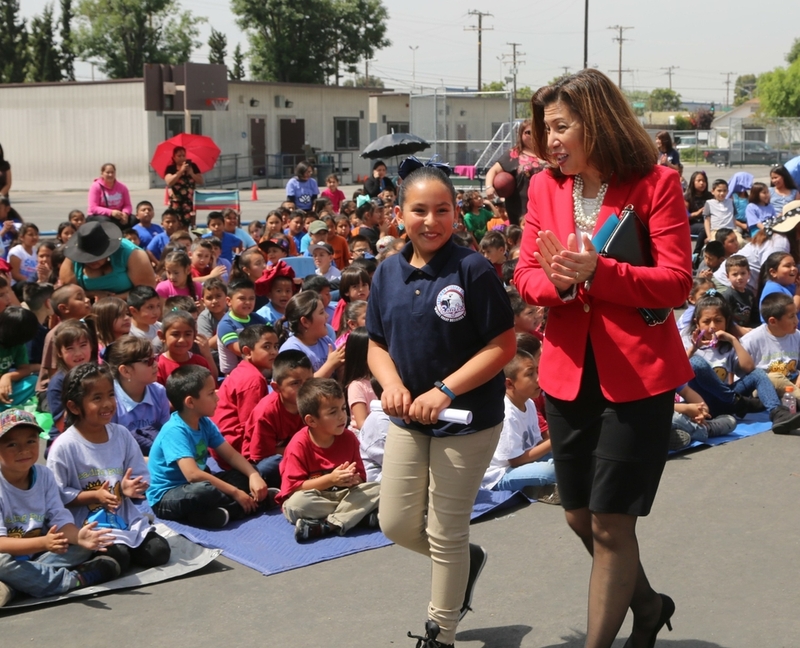 The Power of Democracy’s statewide awards program recognized 56 schools for their achievements in civic learning. Moreover, an increasing number of courts reached out directly to students and their communities by live-streaming court proceedings and offering court visits, mock trials, and speakers’ bureaus. 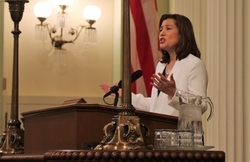 California Chief Justice Tani G. Cantil-Sakauye became the first chief justice in the country to speak out against immigration arrests at courthouses. 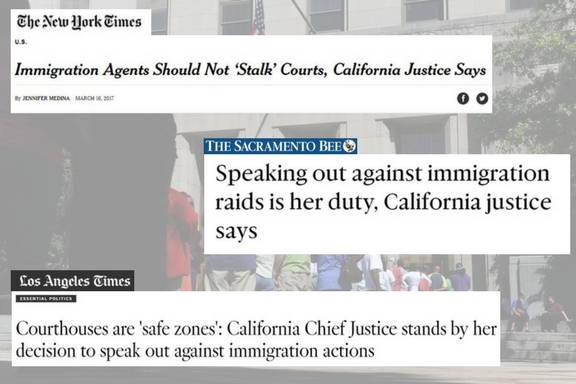 In a letter to U.S. Attorney General Jeff Sessions and former Homeland Security Secretary John Kelly, she warned about the chilling effect the reported arrests have on victims and witnesses, reminding them that “our courthouses serve as a vital forum for ensuring access to justice and protecting public safety.” That same month, the California Judicial Council launched an Immigration Resources Directory to offer a clearinghouse to Californians with questions about immigration law. Helped provide interpreters for many civil case proceedings, as well as interpreters or multilingual staff in non-courtroom proceedings, such as interactions at court clerk’s offices and self-help centers. Offered free legal help via grant funding to 27,000 low-income residents in eviction, child custody, and probate cases. Created and revised court rules and forms to help implement new laws related to firearms relinquishment, restraining orders, child support cases, and other critical issues that impact the public. Ushered in e-filing for all state appellate courts (including the Supreme Court)—many superior courts also offer e-filing for court users. Presented Distinguished Service Awards to three jurists, a court technology leader, and a legal-aid organization for their contributions to expanding fair and equal access to justice. “Chronic underfunding of the courts is just one way a justice system can become unjust."